His Highness Sheikh Mohammed bin Rashid Al Maktoum, Vice-President and Prime Minister of the UAE and Ruler of Dubai, has launched the second round of the Dh1 million Arab Hope Makers award, the largest Arab initiative dedicated to celebrating philanthropic efforts. The initiative seeks to honour and promote the people who spread hope, and who encompass the values of giving, positivity and optimism by dedicating their lives to helping those around them. The initiative encourages people from around the Arab world to submit their stories of hope on the website www.ArabHopeMakers.com. It will celebrate the thousands of people behind the stories and welcomes submissions from any person, team or entity with an initiative, service, or volunteer programme in education, health, environmentalism, awareness or community development. Announcing the second round on Twitter, Sheikh Mohammed said, "The Arab Hope Makers are also the makers of our civilization and our future. Every person has the spirit of giving inside them, and the ability to contribute positively to our society; this is our Arab world's civilizational mission." "There are thousands of people who work silently and tirelessly to help others - these are the true heroes who deserve to be honoured. We will take these people's extraordinary stories, and continue to fight despair and pessimism with their spirit of positive change. In the face of frustration, future generations need to hear their inspiring experiences. I invite everyone in the Arab world to join us on our journey of spreading hope - everyone has something to contribute," he added. "We will work with the Hope Makers, support their humanitarian efforts, help them in their missions, and share their stories proudly as achievements for our Arab society. "This initiative is like a school that annually graduates thousands of positive change makers in our communities," he concluded. 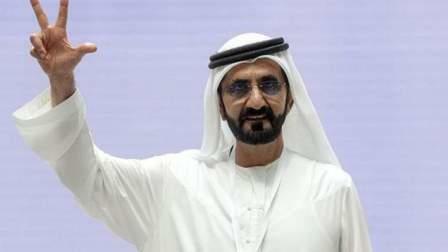 The initiative falls under Mohammed bin Rashid Al Maktoum Global Initiatives (MBRGI) and offers an Dh1 million award to the greatest Arab Hope Maker, who works selflessly, not seeking any fame or monetary reward. The award is meant to help the winner continue their efforts to spread hope and help those in need. Any person who has humanitarian, volunteer or community-based projects or who works with a team or organization within a philanthropic framework, anywhere in the Arab world, can apply to become the next Arab Hope Maker on the website. Sheikh Mohammed published an invitation on his social media accounts for all Arabs wishing to spread hope in their communities. The invitation specifies the qualification of participants, including that they must be Arab, of any age, with any humanitarian experience, fluent in the language of 'giving' and possessing the skill of creating a positive outlook in life. Several committees will be formed in order to evaluate and verify the applications. Meanwhile, the inspiring stories, documented in photos and videos, will be published on the initiative's social networking sites, so that the stories can be widely shared for people to feel inspired. Candidates will pass several qualifying rounds before making it to the final ceremony, to be held in Dubai. The finalists will undergo a comprehensive evaluation, including field visits to follow up on initiatives and documents. Some of the judging criteria for finalists will include their seriousness and commitment, their reputation and credibility, and the impact of their initiatives. After it's launch in February 2017, a whopping 65,000 shared their inspiring stories of hope. It was narrowed down to 20 finalists from across the Arab world. After more consideration, it was narrowed down to the five finalists who would attend the final ceremony in Dubai. Nawal Al Sufi was voted as the Arab Hope Maker in 2017, but Sheikh Mohammed surprised the crowed by awarding all five candidates the grand prize of Dh1 million each, helping to support their hopeful endeavours.